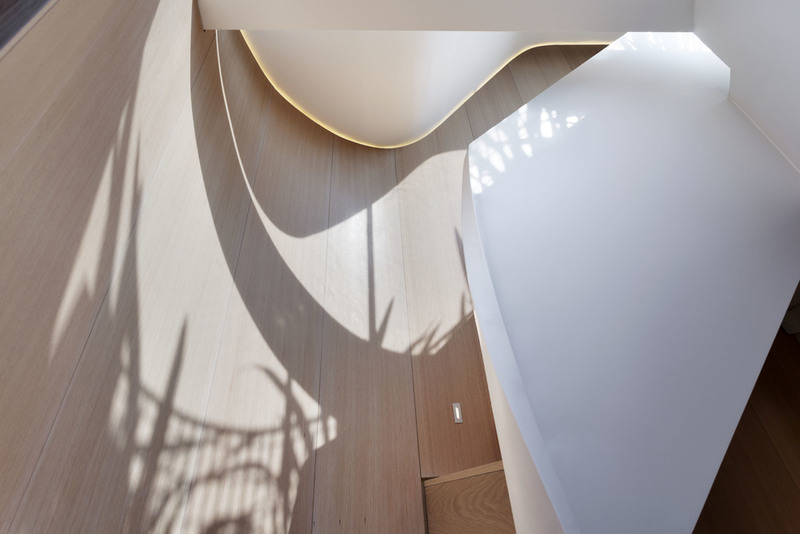 FORMstudio’s Flatiron House makes a virtue of a redundant and impractical office building in central London, transforming it into a home described as ‘a staircase with rooms’. 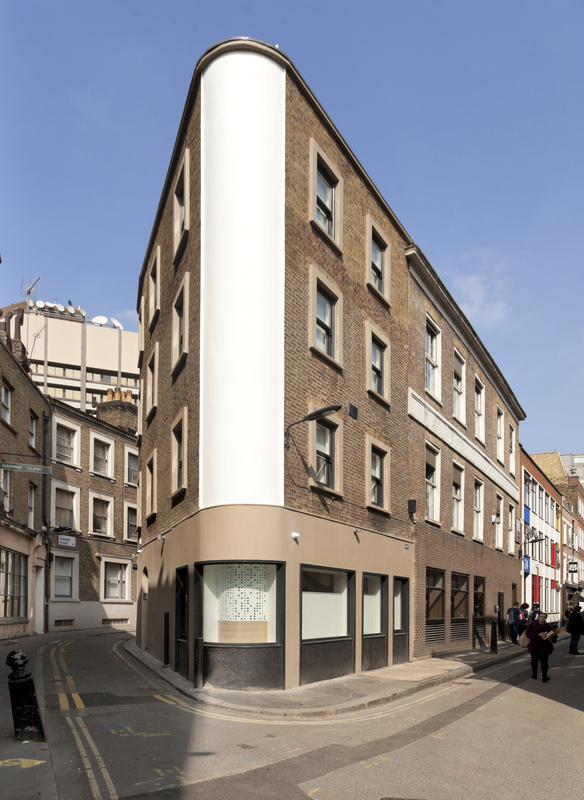 The house is located just off Oxford Street in London's Fitzrovia district. 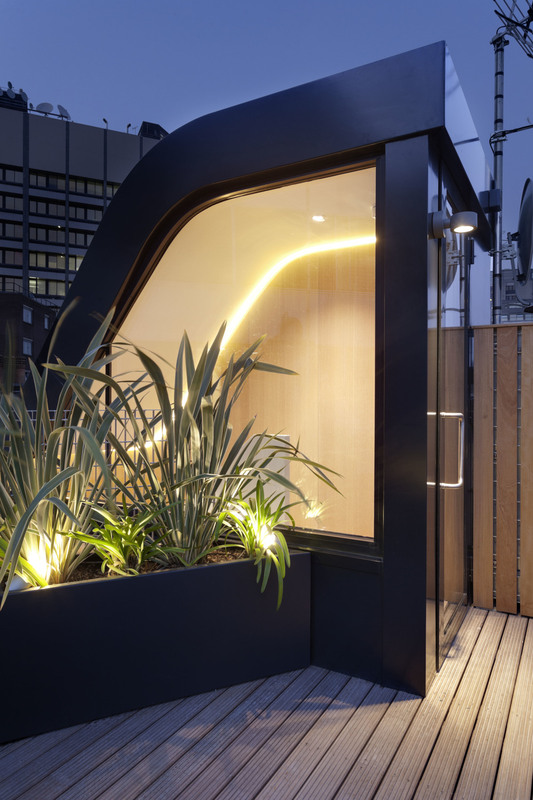 Its small triangular footprint means that only one principal room occupies each of the house's five floors, which is topped by a roof terrace. 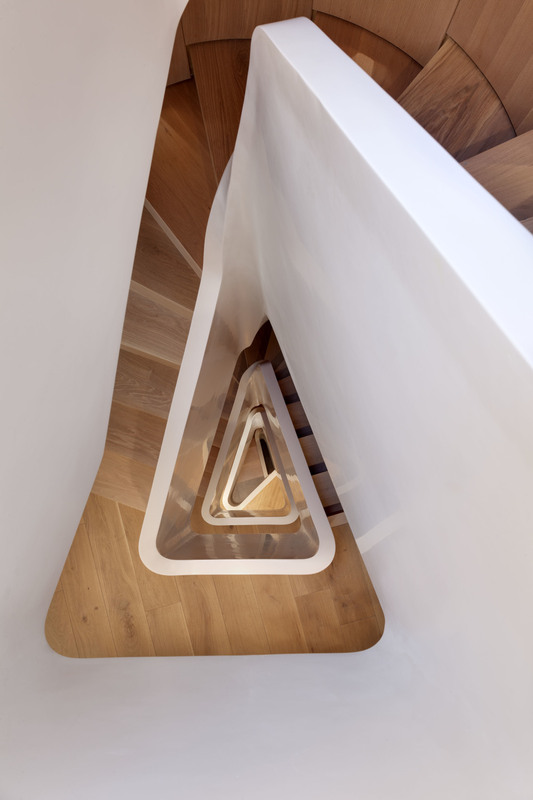 Each space is vertically linked by the signature staircase. 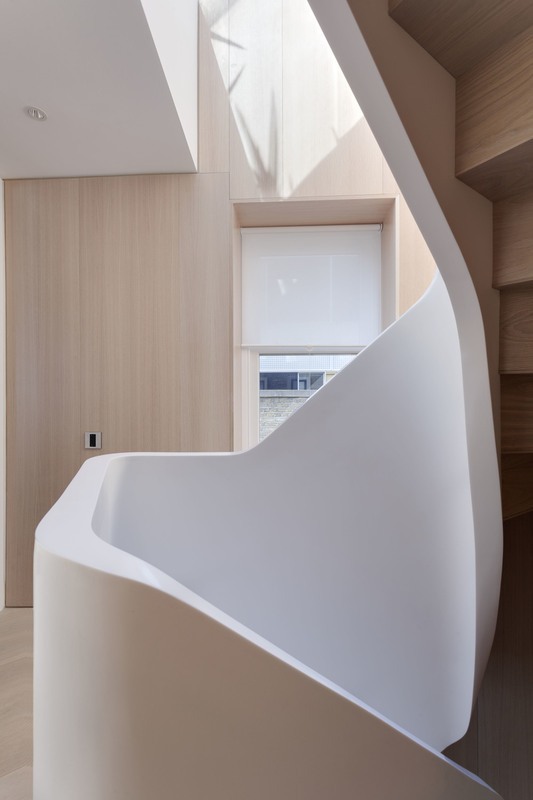 Its white acrylic balustrade falls through the house like a twisted ribbon, framing the 14 metre view from the glass roof to the basement, and giving an unexpected sense of scale. At street level, the previous shopfront has been replaced with a curved window which follows the prow-like shape of the building. Above it, a curved perforated white acrylic screen allows light into the interior space while maintaining privacy. The previously damp vault has been transformed into a wine cellar and media room beneath the street. FORMstudio aims to create places that can be inhabited and experienced by people in a natural and instinctive way. Enjoyable places with a tranquil sense of simplicity, which create a supportive and uplifting backdrop for life. Individual solutions are developed for our clients which are an intelligent, inventive and sustainable response to the complex matrix of issues that shapes each project. Solutions with a lucidity and apparent simplicity which belie their underlying complexity. Listening, analysis, discussion and clarification are at the heart of an inclusive approach that recognises the fact that some of the best ideas are generated in the space between people rather than by individuals. Studying together, and later teaching, at The Bartlett (UCL), directors Malcolm Crayton & Jeremy Lingard first recognised the strengths of combining their shared enthusiasms and complementary skill sets in a collaborative design approach driven and tested by discussion. An approach that has been honed over the years and is at the heart of the practice’s working method today. 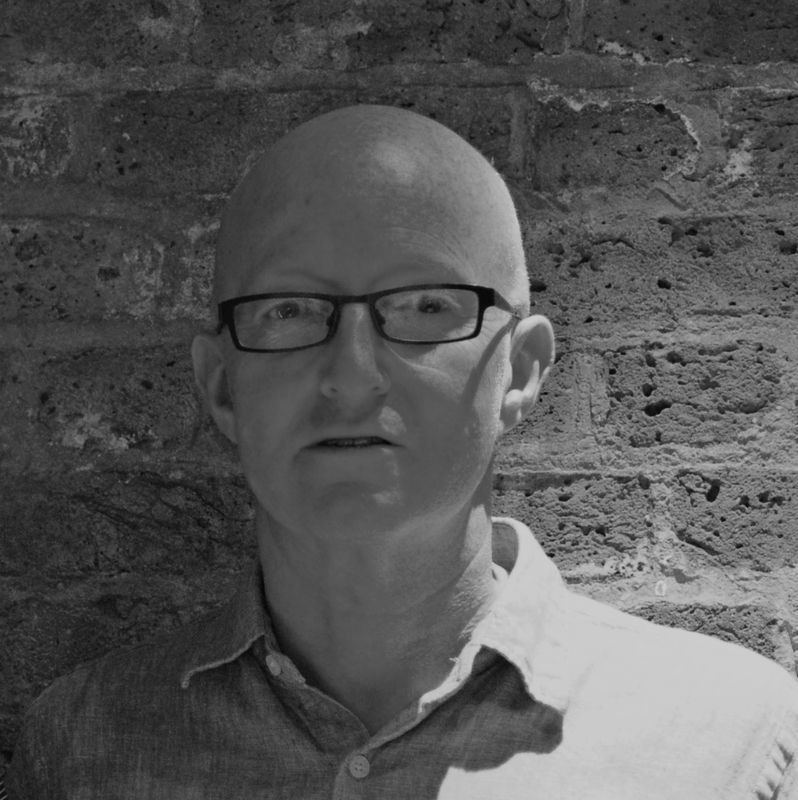 Supported by talented staff including three Associates, who have added further core technical, energy use and design expertise to the practice, the directors maintain a direct involvement in the development and evolution of every project. Investing in people and celebrating diversity, FORMstudio aims to engage with and draw out the particular individual strengths of its staff, developing experience and knowledge base through practice and ideas sharing.